An all-new platform, owing absolutely nothing to the past. How rare that is for Ford Motor Company. 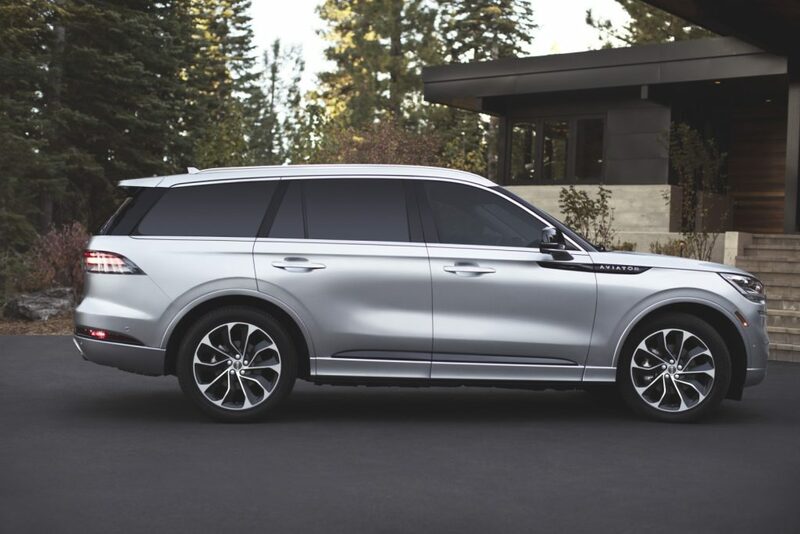 This is the all-new D6 platform used by the 2020 Aviator and 2020 Explorer… and if the information that has been suggested remains true, the all-new 2021/2022 Mustang. With platform consolidation taking place across Ford, we know the 2021 Mustang will move to a new platform, it’s already been announced that a hybrid model is coming in the 2021 Mustang, and this suggests the D6 will underpin the new Mustang. Air bladder front and rear suspension – an option for Lincoln (option over standard coil springs). Battery and gas tank located on either side of the driveline (very unusual). There it is – Ford spent the money for a state-of-the-art suspension. The front lower arms and upright are likely aluminum, and likely the upper arm is too. Further, thanks to a smart spy photographer at the original unveiling of the prototype of the Aviator, we’ve already seen the rear suspension and know that it is the same state-of-the-art design as used in the current Mustang, Fusion, and Edge. Excellent geometry, highly aluminum intensive for weight savings. This bodes well for an all-new 2021 Mustang… with a better front suspension (providing much better camber curve geometry and maintaining it thru the full travel much better than ye-olde strut-type suspension, even with the split lower arm adopted in 2015), essentially the same rear suspension, attention paid to engine placement, and likely heavy use of advanced materials (special steel in critical areas, aluminum-centric suspension and crossmembers) to keep weight down. Of course, there is still time to dumb down the 2021 Mustang, just as the 2005 Mustang was dumbed-down from the DEW-98 platform (loosing its independent rear suspension and double A-arm front suspension). The Mustang has a bad history of dumbing-down, starting with the MN-12 based Mustang planned for the 1992 time frame. Yes, this was based on the then-current T-Bird and would have featured world-class suspension all around, including that elusive double A-Arm front suspension and an independent rear suspension (shortened Thunderbirds spotted around Dearborn were the mules – the idea was so effective that Kenny Brown later built a few shortened Thunderbirds). Look under a T-Bird or Mark-VIII Lincoln next time you are out and you’ll see what we could had if it wasn’t for cost-cutting by Ford and Lincoln. Then look underneath a Lincoln LS (or platform-mate Thunderbird or Jaguar S-Type) and you’ll see another state-of-the-art platform… which at one point was also the plan but again was cancelled when all-things-Nasser were purged (including an updated LS and a smaller Lincoln based on the same platform: the DEW-98 platform was Ford’s own GM Alpha or Nissan FM platform). Alas, cost-cutting and the self-defeating “good enough” view. A mule Lincoln LS with a strut-type front suspension spotted in Ford’s dead mule parking lot next to TGI Fridays in Dearborn (where the engineers hang out) confirmed early on that Ford was dumbing down the platform for the Mustang. And while some heroes at SVT designed a heavier duty IRS for that car, it too was cut in cost savings and we were stuck with an embarrassing sold axle for 10 more years. The other reasons we see the full D6 used for the Mustang? Manufacturing flexibility. The Mustang could now be built on the same assembly line as the Aviator and Explorer (we haven’t been seen where this is going to be built yet, but we know that Flat Rock is to build an all-electric vehicle so the Mustang may be moving). But the best reason of all is that Ford can now afford to build a world-class Mustang… because Ford took the very smart move of selling the current Mustang all around the world – significantly increasing sales and guaranteeing a much larger profit for the Mustang. With increased profit comes investment. So hopefully we won’t get stuck with a dumbed-down platform for the 2021 Mustang. And let’s not forget that GM very successfully uses platform sharing: the Camaro is built on Cadillac’s Alpha platform (a far superior platform to the current Mustang) and enjoys significant component sharing and cost savings because of it. About that hybrid battery placement… while this is solely a hybrid vehicle with a gas engine, there is still a weight question for side-to-side weight balance. The right side will be heavier than the left as the gas tank drains. But the battery is mounted in the middle of the vehicle, which speaks well front/rear balance. And if it had been mounted all the way back it would have impacted 3rd-row seating. we will look forward to seeing what this looks like in vehicles without the battery. About that twin-turbo 3 liter V-6 hybrid engine… with projected power ratings of 450 HP and 600 lb-ft of torque. Yikes! There is no indication that this engine will power the already announced hybrid Mustang (announced a year ago, but without any details whatsoever except a 2020-2021 timeframe) … there is still a 2.3 turbo hybrid motor allegedly being developed for the next Focus RS… and possibly the platform would support a battery in the trunk as in the current hybrid Fusion. But we think not… it’s already been determined that the upcoming Explorer-based police SUV uses a 3-liter hybrid and engineering batteries for two different locations would be cost-prohibitive and an engineering compromise with serious ramifications for weight and integrity. If the 3 liter is offered in the Mustang, then the additional 180 lb-ft of torque over the Mustang GT’s 5 liter V-8 will be an interesting alternative, to say the least! About that drivetrain… some other writers have already pointed it out, but the AWD model of the Aviator and Explorer has a front differential… this suggests that an AWD model of the Mustang could be offered. Is there a market for this? The AWD Dodge Charger (built on a dated Mercedes platform already several generations old) is able to offer this because the platform is shared with other Chrysler and Dodge products. This platform sharing is the key to the financial model for the next Mustang. Instead of being on an “orphan” platform, shared with no other lines (with so many cost implications, plus manufacturing costs of a separate dedicated plant), the Mustang will now be built on a shared platform with the high costs of the expensive suspension and drivetrains (as well as environment and safety systems) shared with the Explorer and Lincoln. However, the 5 liter engine will probably continue to be a hand-me-down from the F-150 budget, as it has been for many many years, and while the next version of this engine will continue to provide thrills for old-school enthusiasts it will also add significant weight to the front end of the Mustang (and don’t bother asking about Ford’s new 7 liter engine, you won’t see it anywhere near here… the original 7 liter “Boss” engine intended for the 2006 Cobra was cancelled for cost reasons – the big block days are over and with the 600 lb-ft or torque offered by the hybrid turbo V-6, it isn’t needed anyway). As to the 2021 Mustang? Watch this space… we should certainly be seeing mules running around the summer of 2019 timeframe.. and covered prototypes over the winter of 2019/2020. Finally, as to the all-new Aviator… we love it. We’ve wanted an Aviator for years (the original short-run of Aviators featured far better seats than the Explorer, with a better engine but poor gas mileage). We like the class, we like the electronics, and we especially like the 30-way seat option. We probably won’t like the price… at this early point with no pricing or final specs announced we’d probably guess a full-tilt turbo hybrid at around 85k. It’s big brother Navigator can go over 100k now with full options. So, again, look down to the 2020 Explorer… and hope for better seats and some excitement in the Explorer ST model.